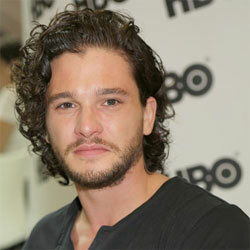 Kit Harington (born Christopher Catesby "Kit" Harington on 26 December 1986 in London, England), is an English actor. He is best know for his role as Jon Snow in the HBO television series Game of Thrones. Harington starred in the movies War Horse and Pompeii. He was the face of Jimmy Choo Man fragrance and men's collection in 2014.